Yoshida, Hiroshi (1876 - 1950), "Fuji from Yoshida"
10 -3/4 x 16 "
Notes: Titled and signed in pencil by the artist. Brush signed and sealed by the artist. "With Hokusai's famous Thirty-six Views of Mount Fuji in mind, Hiroshi made his own series of prints to show the majestic beauty of Japan's highest mountain. 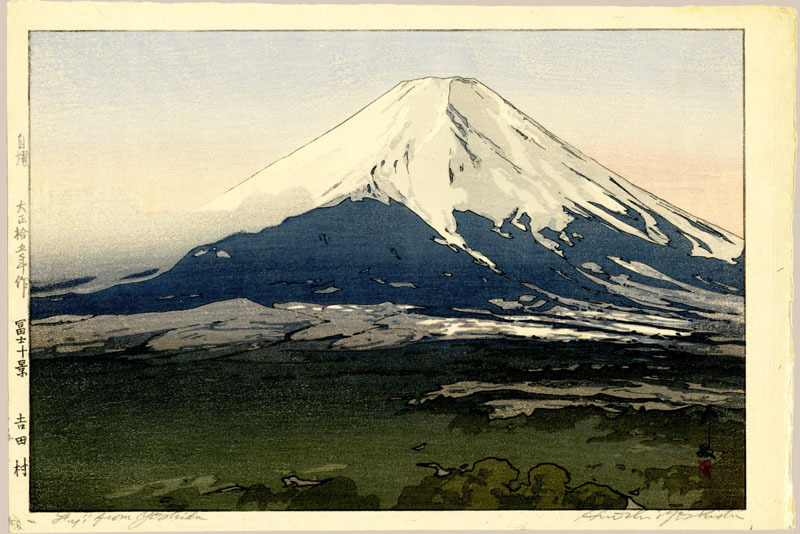 This woodcut belongs to that series, which Hiroshi called Ten Views of Fuji, and was one of three prints made in 1926. The other two, the large-sized 'First Light of The Sun' and mid-sized 'Lake Kawaguchi', are the masterpieces of the group and noted for their great technical precision." - A Japanese Legacy, The Minneapolis Institute of Arts; pg. 50.